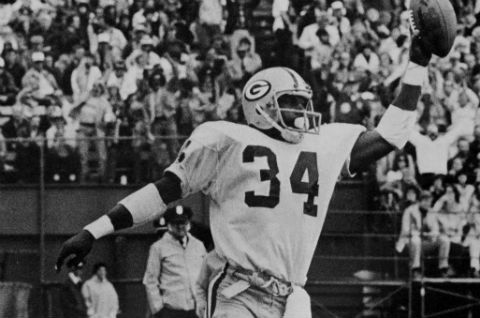 The Green Bay Packers website announced that Terdell Middleton passed away. Middleton was a popular player for the Packers in the late 1970s. He topped the 1,000-yard mark in 1978. The effort landed him on the cover of the 1979 Packers yearbook. Middleton starred at Memphis State in college and was drafted by the St. Louis Cardinals. The Cardinals dealt him to the Packers during the preseason. An occasional return man, he returned a kickoff 85 yards for a touchdown his rookie season. He became the franchise’s fourth 1,000-yard rusher in his second season, but never played a full 16-game slate afterward. The Packers released him before the 1982 season, and he played two years for division rival Tampa Bay before returning to his hometown to play for the USFL’s Memphis Showboats. After leaving football, Middleton reportedly spent 15 years as a firefighter. He passed away just a few days shy of his 60th birthday.